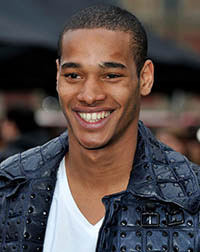 Sacha M'Baye was born in France, on March 20, 1990, is a French male model. He was discovered while riding the tube at the age of seventeen, by model scout from modeling agency Select Model Management London in 2009. He made his catwalk debut for Calvin Klein show in Milan (2010). Became the face of Burberry in 2011. He is of French and Senegalese descent. He was raised in London. He is a brother of model Tidiou M'Baye. Sacha is also semi-pro footballer. Plus Twenty for Soccer Bible, GQ Style UK, Open Lab, GQ France, The Financial Times-How To Spend It Magazine, Carbon Copy, Esquire Spain, Elle France, Used Magazine, Arena Homme +, Hunter, Wonderland, Dolce & Gabbana, i-D Magazine, Spray Magazine, 7TH Man Magazine, British GQ. Gap, Esprit, Burberry, NetWork, H&M, Next Company, Forever 21, Tommy Hilfiger, 3.1 Phillip Lim for Target. Walked runway for Hogan, Emporio Armani, Tod's, Dsquared2, Moschino, Vivienne Westwood, Ermanno Scervino, Ports 1961, Calvin Klein, Dolce & Gabbana. Represented by agencies Paris New Madison, Los Angeles Two Management, Milan Why Not Model Management, London Select Model Management, Barcelona View Management. I had never met Jourdan before, just heard about her. She's a very nice girl, great at what she does and made me look good! I couldn't understand why I would be asked to come and see them - Sacha, Burberry boy? You must be crazy! I'm not sure if I can sit here and try to explain in words how it felt when I heard I got the job; just amazing.